A camera crew catches up with David Brent, the former star of the fictional British series, “The Office” as he now fancies himself a rockstar on the road. ‘David Brent: Life on the Road’ is a funny return for the character of David Brent, although it lacks the sharpness of ‘The Office’ and ultimately doesn’t feel truly necessary. To begin with, let’s be clear. This is not a film version of ‘The Office’ in any shape or form as there’s no involvement from any of the cast or the writing team behind the show, Gervais aside. This is a deeper character study of David Brent and it’s as excruciatingly awkward and cringeworthy as you’d expect, showing a man that has aged but hasn’t really changed a bit. It picks up with Brent years down the line, now working as a rep for a toiletry supplies company, whilst harbouring a passion to live out his dream as a rock star. He decides to get a band together to give it another shot at ‘making it’, taking funds out his pension and an extended break from work to tour. The film retains the mockumentary format of the original series, but it feels more like a tribute than true equal, and there’s more ingenuity and inspiration in the weakest episode of ‘The Office’ than there is here. David Brent has always been Gervais greatest creation, a character who it seems has a little bit of Gervais in him, which perhaps explains the attempts to revive the character further down the line (the parables between Gervais reviving Brent and Brent trying to return to fame are fairly clear). Gervais has such a good handle on the character and he’s everything we expected him to be at this stage in his life. Brent was always a bit of a loser and it’s never felt more pronounced than it does here, 15 years further down the line and as deluded as ever, but at this stage it feels a little sadder as its clear he’s never grown or moved on in the slightest. ‘Life on the Road’ is often more tragic than comedic at times and it does get good mileage out of the path Brent is going down before it backtracks on this more compelling arc for a cheerier ending that feels a little abrupt. This choice is a shame because for a while it appeared that ‘Life on the Road’ was going for something braver and deeper in its character study. There’s not much of a story here, and of what there is, it’s predictable, but it is funny and there are signs of the old spark in some of Brent’s interactions. There are several laugh out loud moments, with a couple of great sight gags and the tragicomic arc of Brent throughout the film yielded some inspired moments, but at times it sinks so deep into cringe comedy you almost feel bad for laughing at Brent’s antics. Many of the laughs come from the catchy songs Brent has written, with typically awful lyrics and riffs that feel like a pub band’s attempt at recapturing the sounds of Brent’s youth, and rapper Doc Brown makes a good foil as one of the few characters who seems to have genuine sympathy for him. ‘Life on the Road’ is pretty much everything I expected, funny and sharp at times but ultimately lacking a purpose. 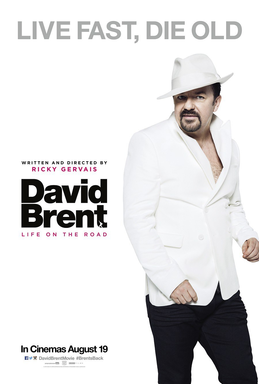 Like the band ‘Foregone Conclusion’ that Brent revives in the film, ‘Life on the Road’ is ultimately a tribute act to the superior original and 15 years down the line, it lacks the edge and inspiration that made ‘The Office’ one of the all time greats.